Bill Ross Fit was founded originally as strictly a fitness company. Over 25 years it evolved into a complete fitness and coaching company. I found out during the journey as a personal trainer that if a client does not change their behaviors towards exercise and nutrition that any weight loss that occurs is only temporary. Knowing this I changed my training programs to include behavior change solutions. By adding the behavior change solutions I was able to increase my clients success rate from 65% to 98%. Whatever your motivation is for improving your health--whether it's to shed a few pounds, or to start a new, healthier lifestyle--selecting the right certified wellness professional can make all the difference to help you reach your fitness goals. 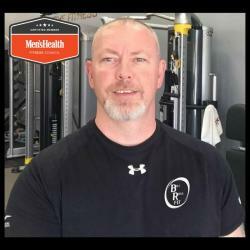 I have been voted one of the best in Denver, with the expertise to assess your strengths and weaknesses and tailor your programs to meet your goals. Discover for yourself the many perks of working one-on-one with a certified wellness professional. I love educating people about fitness and nutrition and how they effect everything in our lives. I have been involved in the fitness world for 25 years as a wellness professional. I have also been athletic my entire life, so you could say that becoming a personal trainer was a natural fit. I knew that from my own training and experiences I knew that I wanted to help people exceed their goals the way I have in my life.